Well this is an extra-ordinary Thrifty Thursday. I found a few nice goodies this week, some were more photogenic than others. Several are going to be works in progress. But the most amazing ‘find’ this week was running into a fellow blogger Diane from Cozy Canadian Cottage and The Elegant Chateau! I think I may have scared her a little. How often does a strange person approach you while you are shopping and suddenly start talking to you? I hope I made her feel a little bit like a celebrity. We only had a few minutes to chat, but hope to get together some time soon to talk all things blogging. But back to the regular thrifty finds photos. 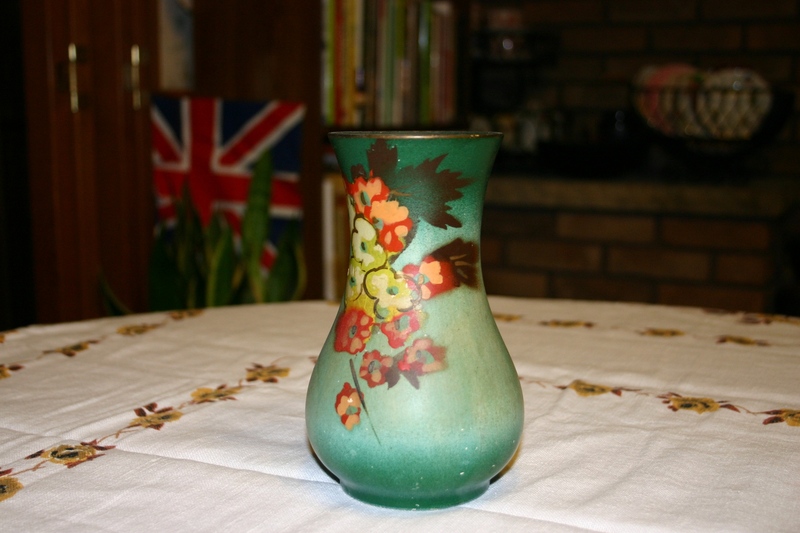 OK this is a cheat again, I found this a while ago, but I fell in love with this vase and the soft colours. 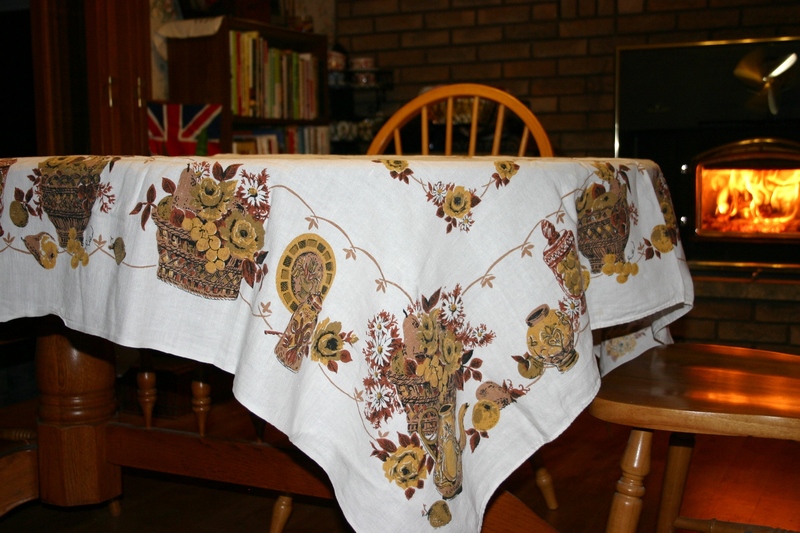 I did find this great vintage tablecloth. Nice colours and in great shape! A nice little Pyrex dish. 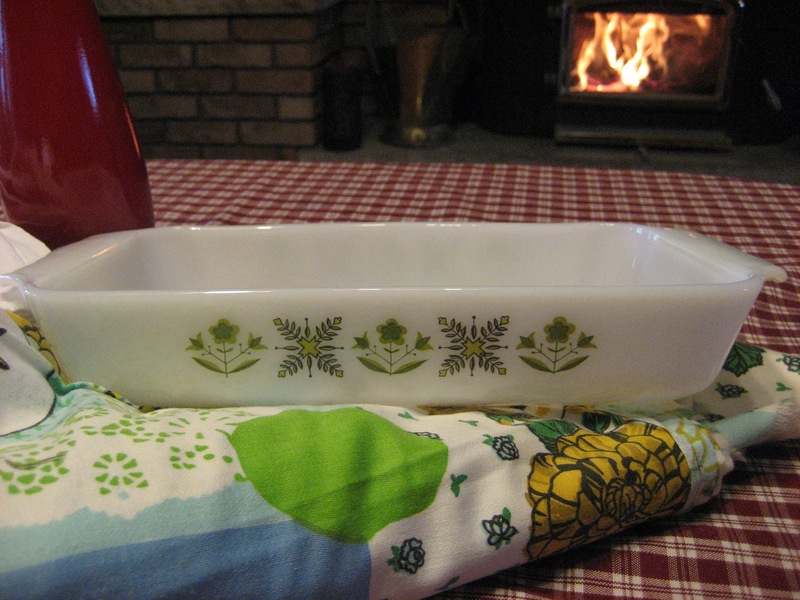 I started buying these vintage Pyrex pieces for Miss Murfin, but I quickly discovered that I enjoy using them. Vintage, cute, and practical! I try to stick to one colour, so I buy green for me and blue for her. But if I ever saw red pieces for a good price….. It is sitting on one of the pieces if vintage fabric. I think this one will make a cute tablecloth. The other pieces went straight into the washing machine. 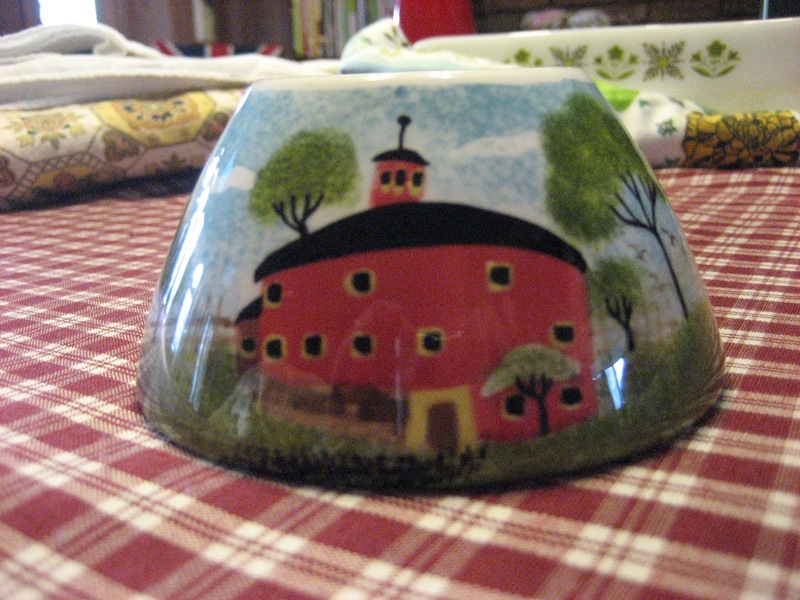 And how could I resist this cute little candle holder with a wee red barn on it? There were also some metal …things that I will make into bird baths for the garden, but they did not photograph well, so wait for them post re-do. 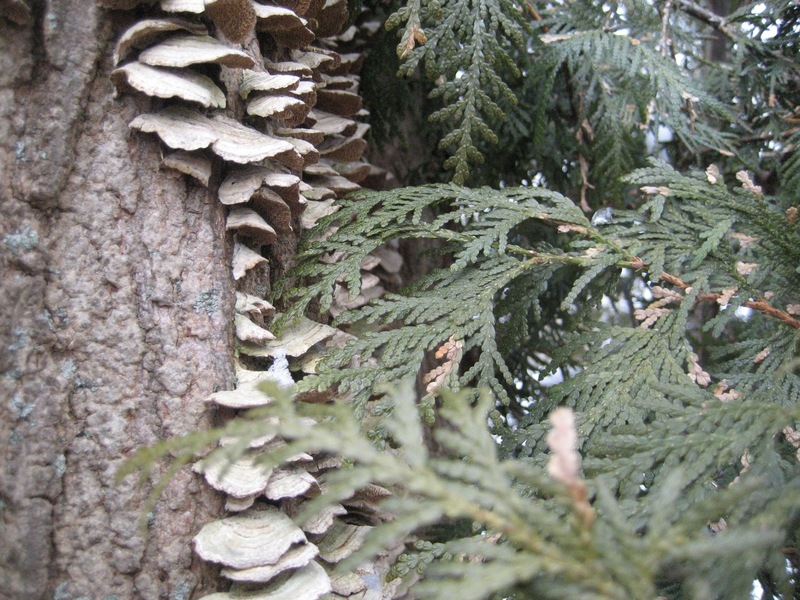 As I was getting out of the car I noticed this fungus growing on a tree …not everyone finds this cool, but it amazes me. And I’m still jealous about the meet and greet!! It will take a bit to get unjealous, so bear with me lil. I love that red plaid fabric, it’s beautiful. 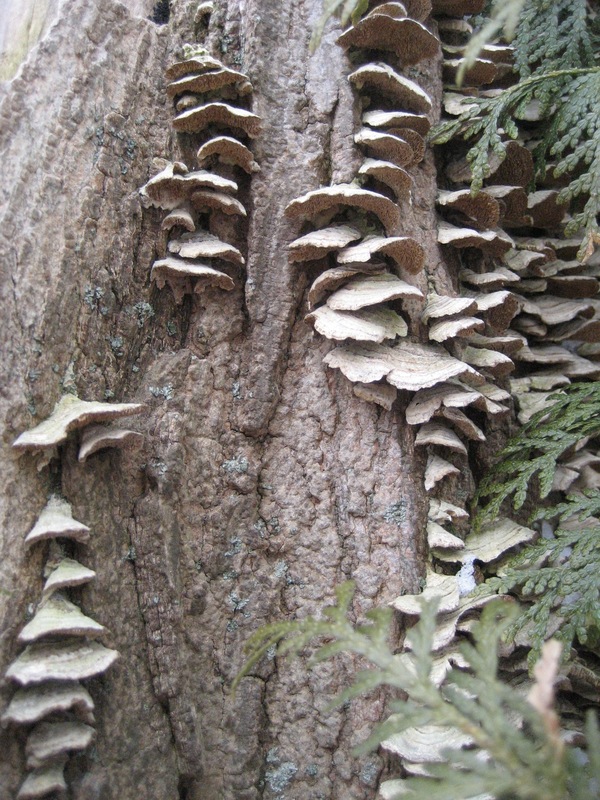 And the fungus – my middle daugther Dani – the purveyor of all things fairy – would tell you that’s a fairy condominium. They’re inside waiting for spring so they can wake your garden up with fairy kisses. DO NOT DISTURB! The muffin man should arrive today. Both he and his mommy, Lesley have battled the stomach virus this week. Let’s hope they don’t bring any stowaway germs with them! The upstairs is clean except my bedroom, and I will do it last after I finish the downstairs this morning. Sadly when I walked into the spare bedroom this morning, there was dust where I had already dusted – ARGH – I fear I will forever be plagued by excess dust. I’m off now to continue the cleaning quest of futility. I have to run to the dollar store later………might I run into you??????? No? Yeah, still not unjealous. Have a great day! LOL. Nothing like drywall dust to stay like an unwanted guest. I have plans for Fairie doors on some of my tree roots this summer I will share pics for Dani!